The hard work on applying decorative plaster deserves to be appreciated as an element of design when creating the original interior. Such an opportunity is provided by covering the facade with a monolithic coating applied in a wide variety of colors and shades, which are offered on the paint materials market today. In addition to the aesthetic role of the coating plays the role of a protective layer, saving from external exposure to temperature drops, precipitation, solar radiation. 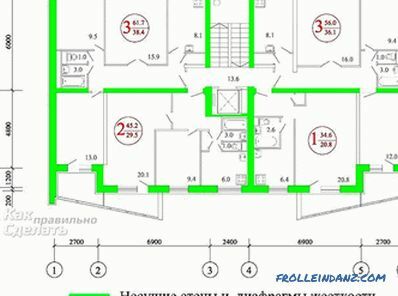 It is possible to increase the degree of protection of the plastered facade with skillful color choices - light colors will prevent overheating of the walls, which, firstly, will save from premature destruction, and secondly, it will save when using the building's air conditioning system. It is possible to give the facade an original color without painting the material after it is applied to the facade. 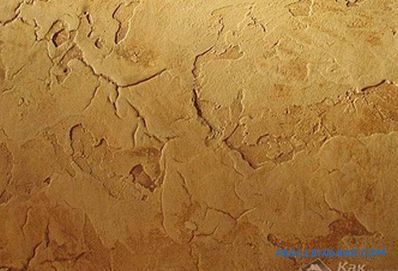 To do this, a so-called color scheme (concentrated powder or liquid) is added to the wet plaster mass before it is applied to the walls, gradually bringing its color to the desired shade. It is worth remembering that when drying, the color becomes lighter by half a tone or even a tone. In this case, you deprive the facade of additional protection against external precipitation, but reduce the amount of work by eliminating the procedure for coating plastered walls. It should be noted that not every plaster the mass is tinted before it is applied to the surface of the walls. This plaster should dry on the facade. We learn how to cover a typical decorative or other material originally white. For this purpose, special facade or interior paints are used. Work on the coating of the applied plaster relief on the walls should begin only after it has completely dried. This may take from 8 to 48 hours depending on the composition of the plaster. 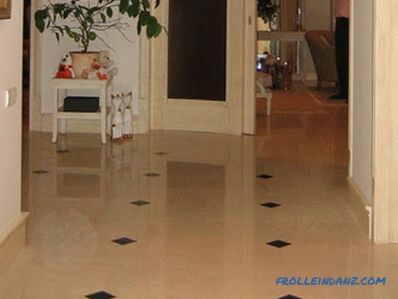 Some mixtures are cement-based, therefore, they are prone to shedding or partial flaking. To strengthen it is treated with a special colorless primer. It is also necessary to leave time for the primer to completely dry, on top of which it is possible to paint the plaster relief. Facilitate any painting, including Among other things, you can learn how to work with decorative plaster with minimal losses if you own some of the secrets of painting work. First of all, it is necessary to acquire the main devices. If the coating will be carried out with a roller, then a tray is needed, which will allow economical dosing of the material on the roller and facilitate its even application. The configuration of the tray allows you to easily remove the excess from the roller. If the work is done indoors, you should consider using protective covering materials that cover the floor, furniture, window sills, windows, door jamb, etc. With a facade covering, protection is required except for the front door, windows, and also it is necessary to protect the path along the wall from splashing. Any painting is done in chaotic movements. This is required in order to avoid abrupt color transitions and not to create different from each other areas of the treated surface. Consider below several coating methods . 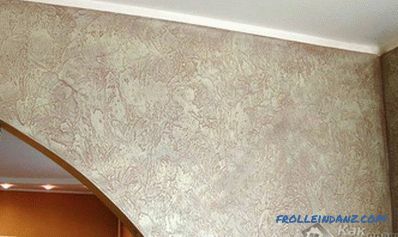 The simplest method for decorative plaster is to cover in one pass. To do this, use a roller with a long pile or an ordinary brush to work out the entire surface, including the protrusions and recesses. We get the "base" shade. More complex effect or the so-called "relief staining" can be obtained if, over the darker "base" layer dried over for at least 2 hours, put on the protrusions of a relief a material of a different shade, usually lighter by half a tone or tone. 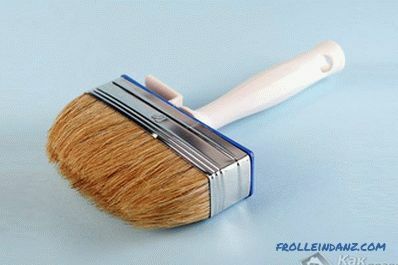 To apply this technique, you will need a brush or a roller with short bristles, on which a minimum amount of material is collected (the so-called “dry brush” technique). The technique of embossed perforation allows to give the surface a large "bulk". The "voluminous" elements of the plaster relief can be tinted with the help of decorative metallic coatings such as bronze, silver, and gold. This type of paint is applied both by the “dry brush” method and with the help of a mitten by the method of feathering the top layer. Mittens easier to achieve smooth color transitions. We must remember that metallic metals do not tolerate excesses, which always speak of the absence of taste. The purpose of the bronze or gold - only slightly shade the base color. Except for the dry brush method applied coating type "erosion". If the first method helps to emphasize the bumps on the surface, then the second highlights cavities. The surface looks more advantageous if, when applied with a “dry brush,” paints of a lighter tone are used compared to the background. In the case of "blurring" the opposite - a darker tone. 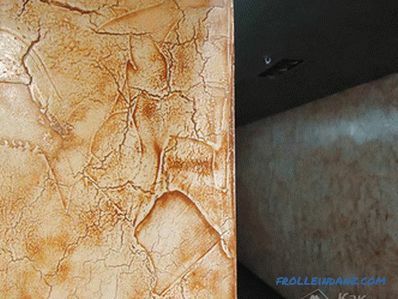 Coating the surface with the “smearing” method is very physical and time consuming, because its essence is as follows: a layer of a darker tone is applied to the main background of the surface, which is left for a short time to dry, and then this upper layer ruthlessly erased with a damp cloth with bumps. As a result, the dark layer remains only in the depressions, thereby creating a voluminous pattern. For applying the background layer under the wash applied good quality material that is resistant to washing the surface of the walls. For the aggregate, on the contrary, a cheaper non-moisture resistant paint is better suited, which will be easier to wash off the surface. Results of both methods are difficult to evaluate by simple comparison, because the matter is only in personal taste or in the customer's request. One thing is to say - to wash the coating is much more difficult and longer than applying with a dry brush. The more textured the surface and the deep relief of the plaster, the greater the consumption of material. 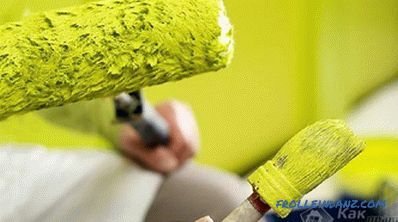 The coating can be carried out not only in one pass, but also in several steps: two layers of background color and finishing with a “dry brush” or “washer”. It should not be forgotten that the excesses of the material may distort the expression of the texture. 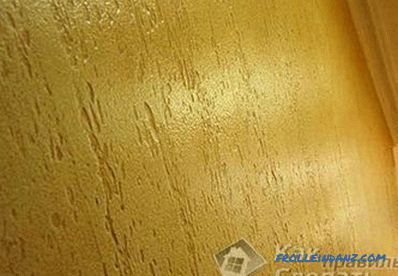 Lacquered Plaster The final "chord" of any staining can be a protective layer of varnish that is applied over the layer of material after its complete drying. Any water-based varnish will do (for example, Tikkurila, Alpina). Before use, it must be diluted in water in a 1: 1 ratio, which will greatly facilitate its penetration into the cavities of the material. The finished mixture is applied wrung out with a wide brush in two or even three times with interruptions to drying (the lacquer is known to dry out very quickly). Apply the mixture immediately to the entire surface of the wall, avoiding smudges. 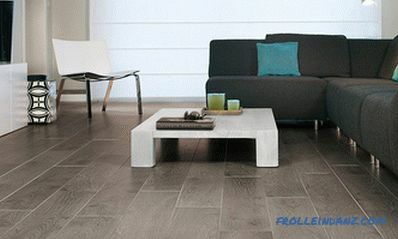 Consumption of the lacquer mixture will be approximately 2.5 liters of lacquer per 50 square meters. meters of surface. 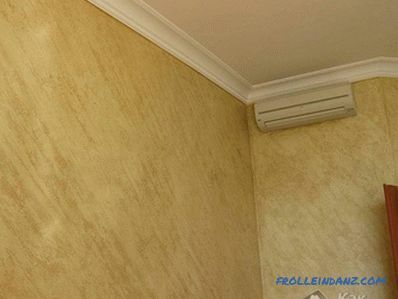 The lacquer will add an exquisite shine to decorative plaster, improve the colors, make it easier to care for the surface, and protect not only the material, but also the plaster design relief from the influence of external destructive factors.